There's nothing more mouth-watering than a trio of delicious flavours packed in one tasty goody bag, which is why we're sure your cat will love our FELIX® GOODY BAG Original Mix with Chicken, Liver & Turkey cat treats. The irresistible combination of turkey, chicken and liver ensure that your cat enjoys every crunchy bite, whilst benefiting from all the essential nutrients and goodness that we include in our treats. Shake the pouch and watch your cat come running to the sound of our yummy FELIX® GOODY BAG Original Mix with Chicken, Liver & Turkey cat treats. 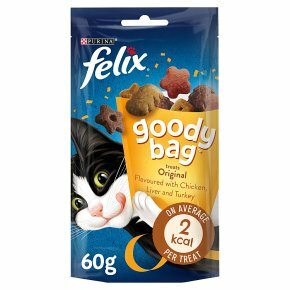 Our specially formulated FELIX® GOODY BAG Original Mix flavoured with Chicken, Liver & Turkey cat treats contain proteins, vitamins and omega 6 fatty acids to help keep your cat supported. Flavoured with chicken, liver and turkey. A colourful mix of meaty treats full of enticing aromas and appealing textures. With three irresistible flavours in every bag, they're Triple the Treat! Tasty textures and irresistible flavours packed in a convenient goody bag for your cat to enjoy. A delicious complementary pet food for adult cats. There's nothing more mouth-watering than a trio of delicious flavours packed in one tasty bag, which is why we're sure your cat will love our FELIX® GOODY BAG Original Mix with Chicken, Liver & Turkey flavoured cat treats. Let your cat enjoy the irresistible combination of turkey, chicken and liver in every crunchy bite, whilst benefiting from all the nutrients we include in our treats. Shake the pouch and watch your cat come running to the sound of our yummy FELIX® GOODY BAG Original Mix cat treats.There's nothing more mouth-watering than a trio of delicious flavours packed in one tasty bag, which is why we're sure your cat will love our FELIX® GOODY BAG Original Mix with Chicken, Liver & Turkey flavoured cat treats. Let your cat enjoy the irresistible combination of turkey, chicken and liver in every crunchy bite, whilst benefiting from all the nutrients we include in our treats. Shake the pouch and watch your cat come running to the sound of our yummy FELIX® GOODY BAG Original Mix cat treats.There's nothing more mouth-watering than a trio of delicious flavours packed in one tasty bag, which is why we're sure your cat will love our FELIX® GOODY BAG Original Mix with Chicken, Liver & Turkey flavoured cat treats. Let your cat enjoy the irresistible combination of turkey, chicken and liver in every crunchy bite, whilst benefiting from all the nutrients we include in our treats. Shake the pouch and watch your cat come running to the sound of our yummy FELIX® GOODY BAG Original Mix cat treats. FELIX® Goody Bag - contains an irresistible, colourful mix of meaty treats that are full of enticing aromas, delicious flavours and appealing textures. Feeding Guide: Daily Feeding amount for a 4kg cat is 13g or approx. 35 pieces. Clean, fresh drinking water should always be available. For your cat's health, respect the feeding guide and adjust your main meal accordingly. Supervise your cat when giving him/her the treats.